I did not write about this earlier because I was in Taiwan! 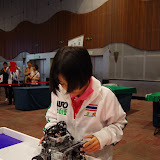 This was my first time experiencing the World Robotics Olympiad (WRO) as it was held in Malaysia and I got to be a judge. It was an exciting experience as I got to see so many talented kids from around the world, competing for honours with their little LEGO robots. Personally, I have always had a thing for out-reach programmes particularly if it involved STEM related fields. I’m also partial towards encouraging more girls to enter these fields as we are sorely lack of female talents, for some reason. The WRO2012 was held across a school holiday weekend in Malaysia. As I was completely involved in the judging for the Open Category on Saturday, I could only enjoy the rest of the competition on Sunday. Things were quite interesting in the other categories too. I particularly liked the inclusion of a new College Category this year. Their robots were a lot bulkier and more robust than the rest as they had to physically compete against each other. I actually met one of my students competing in this category. Malaysia fared well in the Elementary categories by winning both the Open and Regular competitions though we did not do as well in the other categories. Since I was the a judge for the Open Elementary category, I got to witness some of the drama that went along with the judging. Judging is never an easy thing to do and judging kids is an even harder task to accomplish. However, looking at some of the other categories, I was thankful that I had to deal only with the young ones. At the elementary level, there is often a clear gap between the leading teams and the rest, which did help make our jobs easier. All said, it was a good experience for me, both in learning how to manage a small team of international judges and also in enjoying the fun of the entire event! There’s no point in doing any of this if it wasn’t FUN!